“The musical skill and dedication of our young participants and especially this year’s winners certainly set a high mark for excellence,” said Alexander Braginsky, founding president and artistic director of the e-Piano Junior Competition. 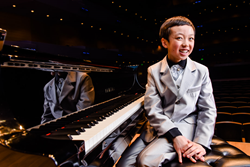 Nathan Lee, 13 from Sammamish, Washington, earned First Place in this year’s e-Piano Junior Competition, capturing the top prize of $8,000 in the international event held in Minnesota over the past six days that showcased the talent of some of the world’s best classical pianists ages 17 and under. The e-Piano Junior Competition, described by some as “where prodigy meets technology,” exclusively uses Yamaha’s Disklavier reproducing pianos in qualifying rounds and in the finals. This groundbreaking technology enables auditions and preliminary rounds to be conducted online, which explains the “e” in the title of the competition. Second Place, which came with a cash prize of $5,000, was awarded to Elliot Wuu, 16 from Freemont, California. The Third Place winner was Arsenii Mun, 16 of St. Petersburg, Russia. The Third Place award is named in memory of Zhang Ning and Liu Yuanzhang, and comes with a cash prize of $3,000. Those talented young pianists, along with two others who rounded out the top five finalists, were among the more than 20 contestants invited to compete, and who hailed from Japan, South Korea, China, Hong Kong, Russia, Taiwan, Canada and the United States. Each contestant performed in two solo rounds starting Wednesday, June 10, progressing to the semi-finals and then the finals on Tuesday, June 16, 2015. The five finalists performed with the Minnesota Orchestra. Held under the auspices of the International Piano-e-Competition at the University of Minnesota School of Music, the e-Piano Junior Competition invited 52 initial participants from around the globe to submit “Virtual Auditions” using Yamaha Disklavier reproducing pianos, which are capable of capturing the pianists’ exact keystrokes, pedal movements and synchronized video of their performance. In March, a panel of judges at the University of Minnesota School of Music gathered in Lloyd Ultan Recital Hall, which is equipped with a Yamaha Disklavier PRO and a projection screen. The Disklavier faithfully reproduced the pianists’ original keystrokes with every nuance from their remote auditions intact, while the pianists’ performance could be seen simultaneously on a big screen in perfect sync with the piano’s keys and pedals, as if the artists were performing “live” for the judges. Competition finalists performed exclusively on a Yamaha Disklavier CFX, with video, keystroke and pedal data streamed live over the Internet. This made it possible for the pianists’ performances with the Minnesota Orchestra to be recreated live on similarly equipped Disklaviers in living rooms nationwide, the instruments’ keys and pedals moving up and down, perfectly in sync with what piano aficionados experienced simultaneously on their big screen televisions. YanZhuo Lee, 14 from Beijing, China earned $2,000 for Fourth Place and Christopher Son Richardson, 16 from Lake Forest Park, Washington was awarded $1,000 for Fifth Place. Elliot Wuu was awarded the $500 Schubert Prize for the best performance of the required Schubert piece in the Second Round. Arsenii Mun was awarded this year’s Variations Prize, earning $500 for the best performance of Beethoven or Mendelssohn Variations in the Semi-Final Round. A total of $20,000 was awarded in the competition, which was launched in 2008. For more information, please visit: http://www.piano-e-competition.com.